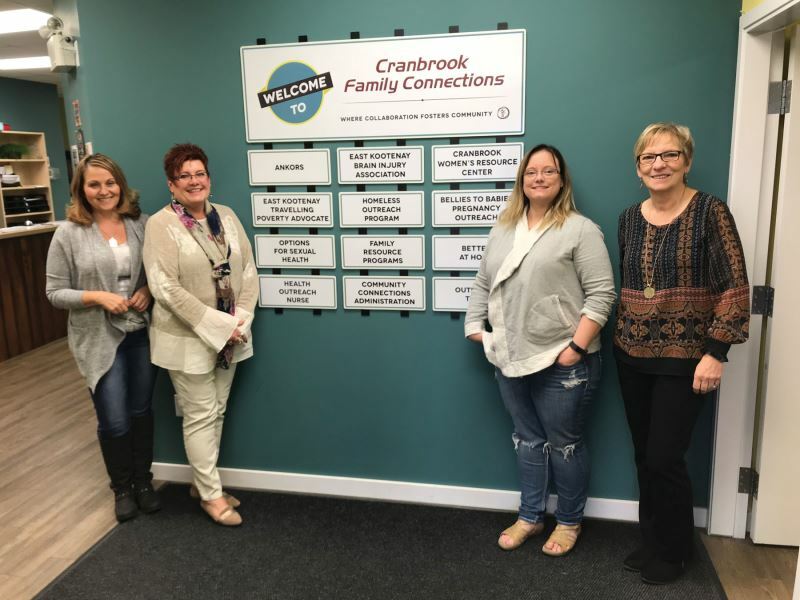 Photo: Research completed by College of the Rockies instructor, Shawna Ryan, highlights the vital role played by Cranbrook Family Connections. Pictured (l-r) Tracy Pound (Homeless Outreach Program), Kim Levie (Cranbrook Family Connections), Erin Pan (Homeless Outreach Program), Gwen Noble (Executive Director, Community Connections Society of BC). College of the Rockies’ Bachelor of Science in Nursing instructor Shawna Ryan and Gwen Noble, Executive Director, Community Connections Society of Southeast British Columbia, recently partnered on an applied research project aimed at understanding and improving health and social services to area residents. Cranbrook Family Connections (CFC), a hub of services offered by the Community Connections Society of Southeast British Columbia, has been providing programs and services to Cranbrook and the East Kootenay region for 36 years. Ryan’s specific objective was to assess the advantages of a co-located, comprehensive, and collective approach to the delivery of social and health services, gather demographic data of CFC clients, and evaluate the diversion of CFC clients from emergency and other health care services. The research resulted in a Collective Impact Report, which will be used to support CFC’s applications for funding. It will also be circulated to local dignitaries and community leaders to help inform them on underserved populations. Of the 161 clients surveyed, 53 indicated that if the health and social services at CFC were not available, they would have gone to their physician, nurse practitioner and/or the emergency room instead. Eighty-five respondents indicated that they would go “nowhere” if it were not for CFC services, highlighting the important role the CFC plays in decreasing social isolation of its clientele. Going forward, Noble is confident this research will help with future funding applications. For more than 40 years, College of the Rockies has provided post-secondary education that meets the needs and aspirations of the people, industry and businesses of our region. Each year, we deliver instruction to approximately 10,000 learners, in a full range of programs, including: skilled trades, university studies, adult upgrading, early childhood education, health and human services, business, office administration, tourism and recreation, fire services, continuing education and general community interest. Through smaller class sizes, highly-personalized instruction and dedicated support services, our students are primed to succeed in the job market, or in the next stage of their academic journey.